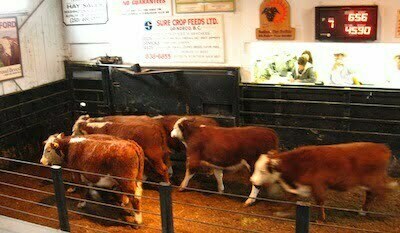 This is what the autumn cattle auction looks like in Okanagan Falls, BC. I went there in October to speak to some of the ranchers who live in the South Okanagan-Similkameen area of southern British Columbia, near Oliver and Keremeos. The ranchers are very concerned about a proposal for a National Park which has been underway for about 7 years. If you drive through the area, you can’t miss the NO NATIONAL PARK signs by the side of the highway. They’re worried a park will threaten their livelihood, because it will mean they’d lose access to crown lands for grazing purposes. On the flip side, the area is very ecologically sensitive and unique in Canada. It’s a desert-like, arid environment full of endangered species, and park proponents are also concerned – they’re worried that, without a park, development will mean big changes to this beautiful and relatively untouched area. One of the reasons it’s untouched is because the ranchers and local First Nations have been such good stewards of the land. 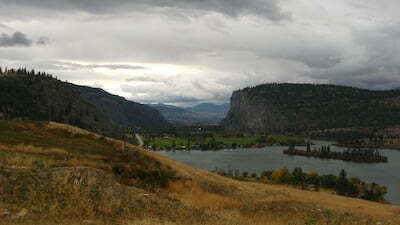 But with so much development in the Okanagan Valley, it’s uncertain whether this ecologically sensitive landscape will survive in the long term, and environmentalists say a National Park is urgently needed. It’s a very complicated situation and the people involved are all very passionate about their particular point of view, whether it’s for or against the park. I put together this report for All Points West on CBC Radio 1 in BC, giving a general overview of this story about a very beautiful and important part of the province in which I live. I suppose it’s probably rather ignorant (arrogant?) of me, but I’d suggest that land use involving ATVs and grazing for cattle don’t really fall under the category of good land stewardship. Not that both couldn’t be done with minimal impact, but so often they’re done in ways that damage the environment. As glad as I was to understand the pro-ranching/anti-park position a bit better, I would have liked to hear more from people who understand the real environmental impacts of existing uses (which shouldn’t necessarily continue just because they’ve been done there for years), and also to get a clearer understanding of exactly where the proposed park boundaries might be. Some of the anti-park rhetoric seems to be making it sound like the park will stretch from Princeton to Kelowna. I also wonder how the anti-park folks feel about Cathedral Provincial Park, with access just outside of Keremeos. It seems like a bit of an anomoly, being a real wilderness park in an epic landscape, yet with a commercial resort and tour company operating there. Hunting is allowed too. So maybe there are hybrid options that would be viable with a national park designation. Hey Jeremy, thanks for your thoughtful and passionate comment. This was a really tough report to put together. I wanted to be as faithful as possible to all sides and not shortchange anyone’s opinion, and also tell the story clearly, giving a balanced overview. As you can imagine that was quite a daunting task. I had to leave a lot of things out, given the limitations of the time I had. And as I learned while I was there, it’s a very complicated, multi-layered story. One of the challenges I faced was giving the pro-side without any direct quote from Parks Canada. (They’re currently in discussions with various local groups, including First Nations, about the park proposal, and they felt it was inappropriate to comment.) I tried to paraphrase some of what they agreed to tell me “on the record”, as it were. If anything, what I hope people got from the report is what a special place this is and how ideologically close the two sides actually are. It was apparent to me during my visit that everyone is interested in protecting the area – they just have different definitions of what protection is and how to go about protecting it. I’m still learning about the risks and benefits of ranching on the environment. I don’t think it’s quite as black-and-white as you might think. Ranching activities can be beneficial, by helping protect lands from development, for example. There are some wonderful examples worldwide of ranchers and environmentalists working together to protect local ecosystems. My understanding is that it’s not impossible that the two groups may yet end up working together here as well. In fact, as both sides will tell you, they already do; they just happen to disagree about some aspects of the national park proposal. However, your intuition is right – I learned that there are some hybrid options that are being explored. It will be interesting to see how this story continues to unfold. It must have been very difficult to try to find that balance. I think you did succeed in showing what’s going on, and why it matters. I’d be very curious to hear from an expert how well ranching is being done in the region right now, especially considering the vulnerability of those unique ecosystems. It is certainly possible that they are a model of sustainability, but I’m not sure we can assume it. The First Nations perspective will be fascinating too — looks like they’ve got a fair bit of land in the area of interest.